It's a casual street market, it's a middle-class mall, it's an upscale riverside dining experience complete with entertainment. That about sums out what Asiatique, Bangkok's newest shopping area just south of Chinatown, is trying to be. If it sounds a little too ambitious, it is, but don't let that deter you from spending an afternoon or evening there. 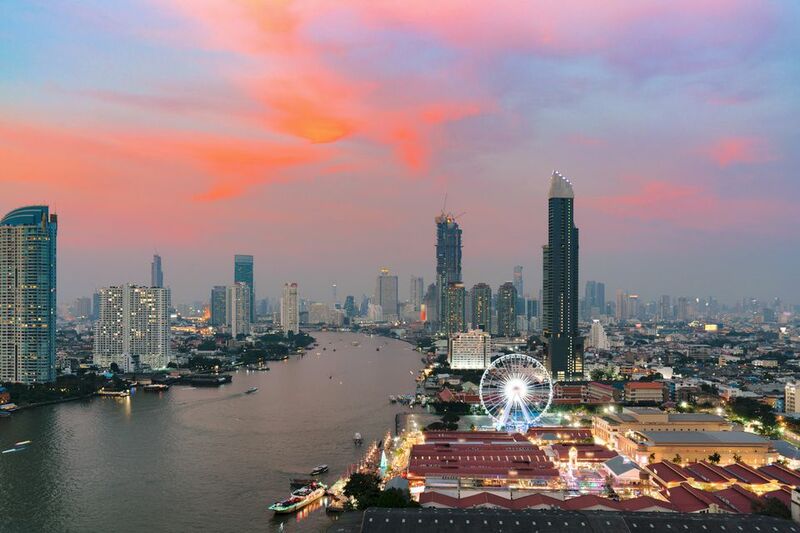 Whether you're looking for souvenirs to bring back to friends and family, a nice place to have dinner and see a show or a destination to stroll around outside with a view of the city and the river, Asiatique really is a great place to go. It's also accessible by public transportation (river ferry), family friendly and will take you to a part of town that's not always seen by outsiders. And since it attracts both visitors and locals, you won't feel like you're in a segregated tourist trap. Located on Charoen Krung Road, Bangkok's oldest thoroughfare, built around a restored pier constructed in the 1900s, Asiatique is supposed to evoke powerful images of Thailand's cultural history. Most of the shopping is in large open buildings designed to replicate massive warehouses that you'll still find in parts of Bangkok. There are fake railway cars and even statues of pedicab drivers and dock workers hefting bags of rice. As critics will point out, Asiatique's developers took their idea a little too far, resulting in an overproduced "experience" that feels more like visiting a theme park with too much shopping than taking a nostalgic look at a fascinating and charming past. That’s all true but, in a way, it doesn't matter, as the theme is just window dressing to what Asiatique has to offer. What it has to offer is this—it’s simply an outdoor riverside mall with fun shopping, a great selection of places to eat and some very cool, very Thai entertainment. There are neatly organized market stalls in one section, higher-end shops in another, a casual food court and lots of stand-alone restaurants. Many of the shopping stalls you’ll find at Asiatique are direct transplants from the old Suan Lum Night Market across the street from Lumphini Park. That means fun, cheap shoes and clothes, touristy housewares, tee shirts and other souvenirs (lots and lots of elephants) but also some higher end clothes made by budding local designers, expensive metalware, and cute, random objects, too. There are stalls that sell locally made spa products and even small spas where you can stop and get a massage or facial. As for food, whether you want to spend 100 baht on dinner or 1,000 baht you’ll find something. Like the old Night Market, the main eating area is an open food court with dozens of vendors offering mostly Thai food. If you’re looking for something less casual, there are also air-conditioned sit-down restaurants (mostly mid-level local chains including Pizza Company and some Thai-Japanese restaurants) and, right on the waterfront, a brewpub and a seafood restaurant. But, you don’t need to spend a lot to enjoy the beautiful view of the Chao Phraya and Bangkok’s high-rises to the north as there’s nothing stopping you from just strolling along the river. As for entertainment, Asiatique has two of Thailand’s most fun cultural shows. The first, the Joe Louis Puppet Theatre, which lost its home when the old Night Market closed, showcases the art of Thai puppetry with hoon lakorn lek puppeteers. These artists perform stories from Thai mythology with their puppets and unlike puppet shows where the puppeteers are hidden, here they are a part of the performance. The show is lovely and lots of fun for kids as well as their parents. Asiatique is also home to the Calypso Cabaret, one of Bangkok’s long-running transvestite variety shows. If you were hoping to watch Thailand’s famous “ladyboys” dressed in drag, dancing and lip-synching to classic show tunes and Asian hits, you are in luck. The nightly shows are lots of fun and though a bit expensive at more than 1,000 baht per ticket, definitely a once-in-a-lifetime experience. All in all, it’s hard to go wrong at Asiatique. Sure, it’s not going to win any awards for authenticity, but if you’re looking for a fun, interesting place to spend an evening you will find plenty to eat, buy and see there.